I think today's comedians have a difficult job. A new joke can be shared with friends via Facebook or Twitter straight after, or even during a show, and whole routines can be seen on YouTube. Consequently audiences can end up with a sense of déjà vu during a comedy show. Even if the audience has not seen a particular routine, it is difficult to make a subject uniquely funny if other comedians have already covered the same topic in every conceivable way. The audience can end up jaded, and the jokes fall flat. Adam Hills' 2011 show, Mess Around, tackled this problem by making every show dependent on audience participation. He also used social media by Tweeting his fans on Twitter and included their tweets in the show. After each show he'd write a blog, extending the audience involvement even after the show had finished. 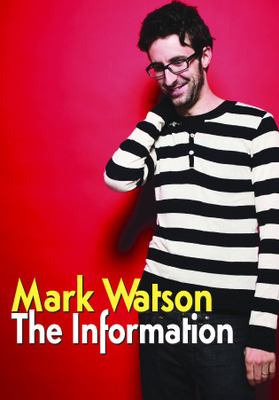 In 2012, UK comedian and novelist, Mark Watson has taken this idea a step further, allowing even more interaction. The Information starts before Mark sets foot on stage. You scan a QR code with your smart phone that links you to a web page where you can vote on entry music, what colour T-shirt Mark should wear, etc. On the website there is also a phone number where you can text funny or interesting things about people you are there with, (but only if you think they won't mind). This will give Mark the information he needs to work fresh and original opportunities for banter into every show. Mark Watson's delivery is fast and earnest, and sometimes goes off on a tangent: I plan to have a pre-show coffee so my brain can keep up. Mark is currently performing The Information in the UK but he will be in Australia for our Comedy Festival season, starting in Adelaide, going on to Brisbane, Melbourne and Sydney, then back to the UK for the huge Edinburgh Fringe Festival. To get the most out of Mark Watson's show visit his blog, updated daily, and read this post The extra information: how to maximise your enjoyment of forthcoming shows. Why? For laughs, and the opportunity to join in the fun. Cost: Varies from around $25 to $38. I have seen the show in Brisbane and it was a hoot. May try to catch this show again in Melbourne.